Archimedes was born in Syracuse, Sicily in the year 287 B.C. He was a very intelligent child; never shying away from challenges, Archimedes loved to solve problems. Very little is known about his childhood other than information about his father and the fact that he studied under some of the greatest scholars of his day. 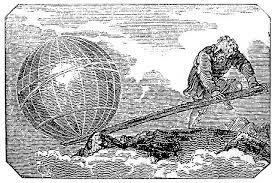 Archimedes’ father was a known Astronomer and Mathematician. This might explain why Archimedes grew up to love science so much. During his educational years Archimedes moved to Alexandria, Egypt and studied with the scholars of the day that studied under Euclid, the father of Geometry. After completing his education Archimedes returned to Syracuse, Sicily. Where he began working for King Hiero (a possible family member). The Archimedes screw was initially invented to move water from low terrains to high terrains. This helped the people of Sicily irrigate their farm lands that were above the water level. The Archimedes screw was also used to move water out from the bottom of ships, so the ship would not sink. Today there are still cases in which the Archimedes screw is used. In some small third world countries the Archimedes screw is still used for irrigation. A version of the Archimedes screw is also used in the present day Netherlands to keep a windmill working. The Archimedes screw is very popular with eco-friendly companies as well because the Archimedes screw uses very little energy. The Archimedes Claw or Crane was a defense machine that was placed in Sicilian cities that were on the coast line. The idea was simple; use a hook to pick up enemy ships and then pull the enemy boat up in the air smashing the enemies onto the shore line. Historians are not 100% sure this actually happened. There is enough evidence to support the fact that Sicilian cities had a large arm that would reach over the water. A far more believable option would be the Archimedes Claw would reach over the water and drop a humungous hook through the enemy ship, and then attempt to raise the hook up. This would at a minimum put a large hole in the enemy ship that could sink it. Enemy sailors could possibly get injured as the hook grabs the ship, and finally the ship could be lifted into the air destroyed if the hook grabs the ship correctly. 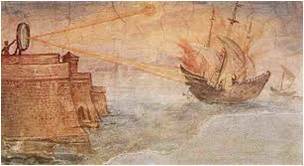 The death ray was an invention where Archimedes put a bunch of mirrors in a formation that was able to focus the energy from the sun and shoot it at enemy ships. The hope was Archimedes would cause the enemy ships to light on fire. This is very difficult to prove that it happened. But as history teaches us it is not that important if it actually happened because local enemy thought Archimedes could do it and that proved to be more important. Enemies became intimidated and choose not to mess with Archimedes city. In 2005 a class at Massachusetts Institute of Technology (MIT) ran a test with mirrors on top of a building. They pointed over 100 mirrors at a wooden ship model and caught it on fire by focusing the suns energy onto one spot on the ship. By no means does this prove Archimedes had and used a death ray, but it does prove that it was possible. It was said that Archimedes had been confused by a tasking given to him by the King of Sicily. The King had asked a goldsmith to make a crown for him. For some reason the King believed that the goldsmith did not use all of the gold given to him. Archimedes was tasked to prove it without harming the crown. Archimedes solved this problem by getting a tub of water, the crown and an equal amount of gold that the king gave the goldsmith. Archimedes put the equal amount of gold in the water and marked the line that the water rose to. Next he took the gold out of the water and put the crown in the water. The laws of hydrostatic says if the golden crown were truly made of gold then the water level would raise to the same line as the equal amount of gold. The fact the gold is shaped into different positions doesn’t matter, the gold will still weight the same. The story ended badly for the goldsmith as the water level did not rise to the same line. The goldsmith was arrested and sentenced for stealing gold from the king. He later admitted that he filled some of the crown with silver. 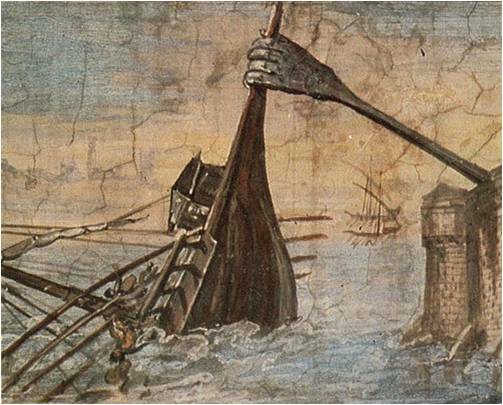 Archimedes did not invent the catapult; however he did make it more accurate for Sicily. This became very important for the Sicily because Archimedes lived through the first Punic war. The first Punic was may have been between Rome and Carthage, but a lot of this war happened in, on or around the country of Sicily. So the King Hiero II needed war materials and the ability to defend himself. A more accurate catapult would have been a very big invention of this time. Again, these three things were not invented by Archimedes, but he sure loved them and used them a lot. Just about every aspect of the Archimedes Claw would have needed a lot of pulleys and possibly levers and fulcrums too. Many of Archimedes inventions centered around these inventions. Archimedes upgraded the value of PI. Previous mathematicians created an approximate value for PI, but Archimedes found a way to repeat specific steps of the mathematical process in an effort to create a more accurate answer for PI. Archimedes wanted to know how many grains of sand there were in the universe. He created his own numbering system based around the Greek myriad (or uncountable) and then he went to work. Archimedes finally answered his question as 8×1063 where each nomination equals 100 million. “If thou art diligent and wise, O stranger, compute the number of cattle of the Sun, who once upon a time grazed on the fields of the Thrinacian isle of Sicily, divided into four herds of different colours, one milk white, another a glossy black, a third yellow and the last dappled. In each herd were bulls, mighty in number according to these proportions: Understand, stranger, that the white bulls were equal to a half and a third of the black together with the whole of the yellow, while the black were equal to the fourth part of the dappled and a fifth, together with, once more, the whole of the yellow. Observe further that the remaining bulls, the dappled, were equal to a sixth part of the white and a seventh, together with all of the yellow. These were the proportions of the cows: The white were precisely equal to the third part and a fourth of the whole herd of the black; while the black were equal to the fourth part once more of the dappled and with it a fifth part, when all, including the bulls, went to pasture together. Now the dappled in four parts were equal in number to a fifth part and a sixth of the yellow herd. Finally the yellow were in number equal to a sixth part and a seventh of the white herd. If thou canst accurately tell, O stranger, the number of cattle of the Sun, giving separately the number of well-fed bulls and again the number of females according to each colour, thou wouldst not be called unskilled or ignorant of numbers, but not yet shalt thou be numbered among the wise. Archimedes sent this math problem to Eratoshenes of Cyrene for the purpose of having the problem investigated by the mathematicians at Alexandria, Egypt; the scholarly home of the Hellenistic era. This problem was written nearly 250 years before the death of Christ, and it was not until 1880 when the problema bovinum was even remotely answered. Without a computer a German mathematician proved the answer started out 7766. (and then went on for 206, 545 digits). Over the next 85 years mathematicians took the answer out 40 more digits. Finally in 1981 a computer “Cray-1” was given the problema bovinum and Cray-1 solved it within 10 minutes of straight processing, and the subsequent print out was 47 pages long. This entry was tagged Archimedes Early Life of Archimedes Archimedes. Bookmark the permalink.